Are we growing in faith, hope and love? My son is a fruit appraiser. Grapes, blueberries, strawberries, bananas, apples. Before he consents to put one in his mouth, he will carefully evaluate it. Look at it from every angle. Smell it. Check for squishy parts. Only after determining that it rises to his standards, will he eat it. Bananas are acceptable for about twelve minutes in their progress from green to brown. Blueberries and grapes have to be perfectly firm with no visible blemishes. Apples can’t be bruised. In our house, Lucas gets the perfect produce, and all the rest of us eat the sad, blemished, castoffs. I think my son is a bit extreme, but his fruit evaluation reminds me of an important spiritual principle. In Matthew 7, Jesus taught us how to evaluate spiritual teachers. He said, “You will know them by their fruit.” The principle is this: Looking at the fruit will tell you about the nature of the tree. What kind of tree is it? Is it healthy? And I just have to say it… I’m looking around at the American church, at Christianity as it is showing up in culture today, and in far too many cases the fruit just isn’t beautiful, tasty or good. Do you have that sense, too? What fruit are we looking for? Now, be careful! “You will know them by their fruit” is not permission to discount anything and everything we personally don’t like. This isn’t a nice metaphor for moral judgement, either. In simplest terms, fruit means results. If you plant peach trees, and take proper care of them, the result is that you get peaches. That’s the natural, organic, result. So, in scripture “fruit” is what naturally, organically occurs as the result of seeking God. In Galatians, Paul talks about the fruit that will grow in the life of individuals when the Holy Spirit has more and more access to their hearts. What will we see in the lives of such people? We’ll see more love, joy, peace, patience, kindness, goodness, faith, gentleness and self-control. Do you notice the three qualities? We have heard of your faith… and your love… that you have because of hope. Faith. Hope. Love. Does that ring a bell? These three qualities are themes for Paul. They appear again and again in his letters to the churches. That is because, for Paul, these three qualities encapsulate the character of churches that have truly understood the gospel and are growing in spiritual maturity. This is the fruit: Faith, hope and love. Time or a reality check. Now, look around you. Look at the Christians you see in the public sphere. Look at the churches you are familiar with. Look at your own community of faith. 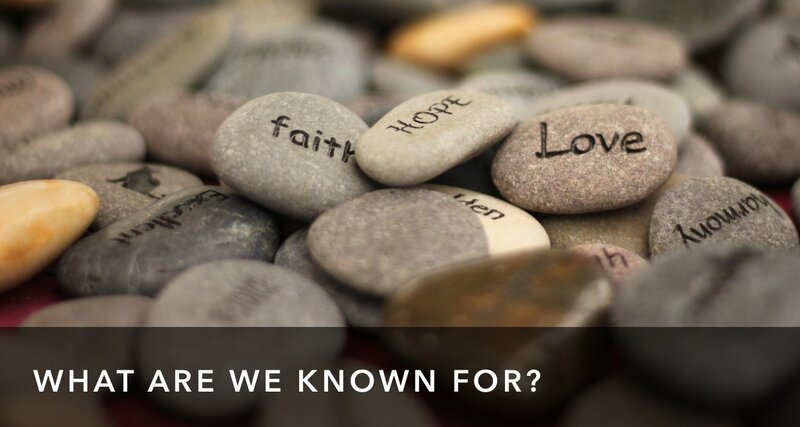 Are these expressions of Christianity marked by growing faith, hope, and love? As I look around I’m seeing more and more Christians living in ways that are anxious, fearful and suspicious. I’m seeing more of my brothers and sisters relating to each other and those around them in ways that are stingy rather than generous, condemning rather than gracious, disrespectful rather than respectful. And I see this across the board, conservative and liberal. I see conservative Christian friends, intent on protecting important values, doing so in ways that are harsh, dehumanizing and even, at times, with a brutal ends-justify-the-means pragmatism. It seems like many of my friends in more conservative churches have decided to accept a terrible trade: So long as they can get the “right” kind of supreme court appointment, they are willing to withhold prophetic accountability of government officials, or turn their eyes from brutal policies that do malicious harm to already struggling people. They didn’t (after all) elect a pastor-in-chief. The words and actions coming out of this community seem driven by fear, and a narrow winer-take-all view of the world. Then, I have liberal Christian friends, gladly accepting the moniker of “social justice warrior,” determined to stand with the marginalized, and welcome all to the table. And yet, as welcoming as their philosophy ought to be, I see them engaging the conversation in strident, condemning tones every bit as preoccupied with purity as the fundamentalists of my childhood church were. The definition of purity has changed to be sure, but the moral and tone policing feels exactly the same. Even though the desired outcomes sound so positive, the attitudes of many in this community seem dark and cynical. And these people—on both sides—identify as Christians. These are people who follow Jesus, the one who taught us the way of other-centered self-sacrificial love! Where is there the fruit of growing faith, hope and love? Radical in the right ways. There is something good and necessary in the conservative instinct to protect what is precious and important. It is a myth that all cultural, religious or technological progress is good. Sometimes the best wisdom for us can be found in the practices and words of our elders. And yet, if we protect some cherished value at the cost of the hearts and dignity of the people we disagree with, we are, in Paul’s words, a clanging cymbal. Worse, we become the oppressive power we rail against. In the same way, there is something Godly in the liberal instinct to ever-widen the table, making sure that people who have been silenced, or pushed to the side, or injured, are heard, valued, included and given the space to thrive, even lead. The Bible is, from start to finish, the story of marginalized people trying to honor God in the shadow of oppressive empires and powers. And yet, if in our work to push wide the gates of our faith community, we trample folks for whom Christ died, we undermine our own message of grace and healing. Understand, this is not a call for a both/and responses. To stand in the middle, wringing hands and asking everyone to just be nice isn’t helpful. There certainly are times when issues of the day require bold and prophetic response. And yet, prophets who follow the way of Jesus have their path marked out for them. That path is a path of other-centered love and self-sacrifice. That means communities that are led by the Spirit of Jesus will not just exhibit passion for important causes. Regardless of what side of the spectrum we find ourselves on, our commitment to Jesus will shape us. The Gospel should, as Colossians declares, “bear fruit” in our lives. 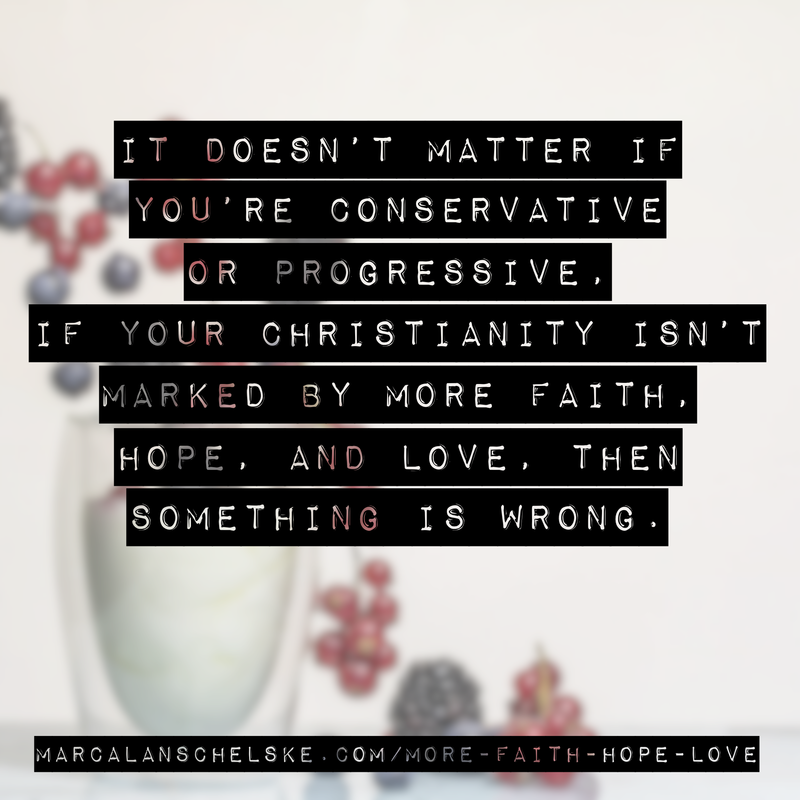 If our Christian communities are not marked by more faith, more hope and more love, then the fruit is telling us something is wrong. Sick fruit comes from a sick tree. Regardless of the way we approach culture, we should be known as the early church was known. Radical. But not radically self-seeking. Not radically invested in our political party. Not radically condemning of those we disagree with. No! The Holy Spirit will manifest among us in this way: radical faith, radical hope, radical love. More faith, more hope, more love.